I’ve been reading a lot of self-published books lately, and nearly 99% of these are one or two edits short of ready (in terms of style and content). One way to rectify this is to find reliable beta-readers, and then listen to what they have to say. Whenever someone asks for beta-readers, they always say that they want brutally honest feedback, but I’ve been beta-reading since it was called “Hey, can you read my novel,” and it has been my experience that generally they do not want you to be too honest. As to what they do want, I can’t really speculate, confirmation perhaps, but they don’t seem to want that for which they’ve asked. If you ask people to read your manuscript, the hope is that you did so to make it better; let them do the job you asked them to do. If a beta-reader comes back and says that your manuscript is not ready, then you should listen to them because this is a READER telling you that they probably would not buy your book. If a beta-reader says a particular image, metaphor, sentence, passage, paragraph, or chapter, isn’t working for them, and your first impulse is to explain it, or tell them why they are wrong, then there’s a 99% chance that there is a problem with said image, metaphor, sentence, passage, paragraph, or chapter. I can’t express this strongly enough; if you have to explain it, it doesn’t work. Can you explain it to every reader? You’re a writer; what you mean is suppose to be on the page. You asked someone to read and give feedback, and they read, and hopefully gave you what you asked for, whether to liked it, or actually really wanted it. Whether you ultimately accept or use the advice or correction given, SHUT UP. Why? Beta-reading can be hard, time consuming, work. Be thankful. If you ask for advice and someone gives it, they’re not interested in why you don’t want THAT advice. Take or don’t take, that’s your business, but keep it to yourself. Unless you have a huge pool of potential readers from which to draw, defensiveness and a lack of gratitude will saddle you with a reputation as someone adverse to criticism, leaving you with no one who can provide needed feedback. There is nothing wrong with writing to write, but if you plan to publish, take it seriously, and when I say seriously, I mean as death. As I prepare to leave Hawaii for the U.S. mainland, I’m strapped for time, and subsequently behind in my writing, including this blog, and the third Frank Keegan mystery, Lost Daughters. So, I thought I would fill the gap with some reviews of the first Keegan mystery. Frank Keegan isn’t a 1940s Sherlock Holmes. A Navy MP coming back from the war and just trying to get drunk before heading back to San Diego, Keegan doesn’t have any super powers, mind palaces or even enough cigarettes. So he’s got to crack the case the good ol’ fashioned way. A man walks into a Honolulu bar and gets caught up in a murder of Navy Lieutenant Elizabeth “Betsy” Vale. The top brass want to keep things in-house and since Keegan found the body and is a former cop, he’s their guy. Part of the fun is going through the gallery of rogues and trying to figure it out whether it’s the husband, the Chinese mob boss or even the FBI. Between bar fights and car chases, Keegan chases some great skirt. This book is a dime novel after all, so don’t expect it to pass the Bechdel test with flying colors. But that being said, the female characters in the book are nicely fleshed out and aren’t just carbon copy movie props. There’s more to love about each of them than just their looks. Even in just a few paragraphs, you get a chance to really meet them. “And that’s actually true of all the characters. Keegan is action hero tough, but he does really get beaten up along the way. As he is trying to figure this all out, you can sense he’d rather be doing something else but can’t help himself from doing the right thing. Liao and McDermid have been able to breathe life into everyone, whether it’s the gambling boss or the bartender’s girlfriend. “Really, really enjoyed this book. “Recent detective thrillers left me bogged down with details, muddled character motivations or forced character development. “Red Betsy” was what I’ve been craving for a long time. It harkens back to the dark heroes of Raymond Chandler. The setting is post-WWII Hawaii but it neither felt dated nor was it didactically over-explaining details of the setting. And then, there are these two, both of which I’m still smiling about . . .
Ross Macdonald is a favorite of both myself and Aki, one of the authors we strive to emulate. I can’t speak for Aki, but to come within a half-star of this great is praise beyond measure! And then to also be compared with Mickey Spillane! I’d have to be called the next Raymond Chandler to top this! Back in “Winging It #1” I discussed how the basic structure of a mystery required a setting, and a detective, and a crime, and how that crime is most often a murder. A Halo for Red Betsy is standard detective fare in this way; the victim is killed and a detective is tasked with finding the killer. As our first novel, we thought it best to stick with something basic, especially since all we knew about writing in this genre we had garnered from reading other such novels. In other words, we had no idea what we were doing, but it provides for a wild ride. One thing we did, and I would not do this again, was to decide on some of the clues and red herrings without being certain as to how they contributed to the story. Three such clues were a Lieutenant Commander’s insignia (the rank of the chief suspect) found in the victim’s hotel room, and a hand bag missing from that same room, and $10,000 hidden in the victim’s apartment. I honestly had no idea how we would use these clues/red herrings when we started writing, though we found ways to make them work. Still, I would not want to repeat that process. While there is a murder The Cheongsam Bombshell, the chief suspect is Keegan’s girl, Julie Flynn. Frank knows she’s being framed and so has his hands full keeping her safe while he searches for the actual killer without the help of the police, who are focused on Julie. With regards to clues, we took different approach in writing The Cheongsam Bombshell, deciding what clues were needed along the way, and whatever red herrings we could get away with, and writing them in. This method had advantages over how we approached Betsy because we painted ourselves into fewer corners, but it also involved returning to completed material to plant clues. We’ve put more planning into Lost Daughters, the third Frank Keegan mystery, and don’t intend on dropping in random clues. Still, the writing method is the same; we start with Chapter One and move forward, making it up as we go, albeit within a clear frame work. Unlike with Betsy, I think that this time we have a clearer idea about where we want to go, and won’t be making major changes along the way. Especially since we already have a plan for Book 4 and we need this one to end where that one begins. That is the plan, anyway. The characters, both new and returning, may have other ideas. “Where’s your father in all of this?” I asked for something to say. “Who the hell knows?” she said, snuffing out her cigarette and reaching for another. “Help yourself,” I said, sliding my Zippo across the table. You get the idea. By the time she was finished, I liked her so well I didn’t want to kill her. Yes, I know that it’s advised that we “kill our darlings,” but I had other plans for her—she became the title character in the second Frank Keegan mystery, The Cheongsam Bombshell. I started the writing The Cheongsam Bombshell on November 1st, 2013. I know the exact date because it that year’s book for National Novel Writing Month, also known as NaNoWriMo, a yearly event that challenges writers to complete a 50,000 word manuscript in 30 days. Aki was doubtful about a story centering on Julie, but I needed a story for November. Plus, I had something in mind and I want to run with it. In fact, I began the story from Julie’s point of view, which I couldn’t maintain, but it got me started. 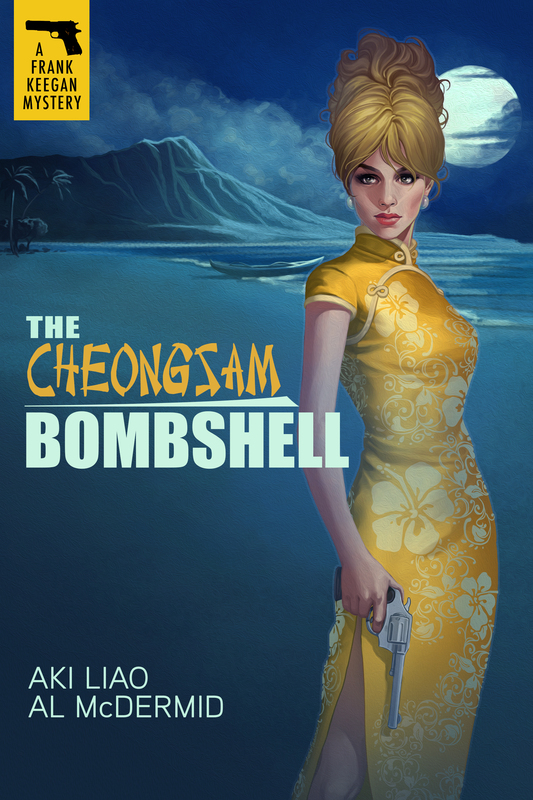 The Kindle version of The Cheongsam Bombshell, starring Julie Flynn in the title role, will be available tomorrow. Download a sample and check it out. The three characters essential to a murder mystery are the victim, the killer or villain, and the detective (or detectives). 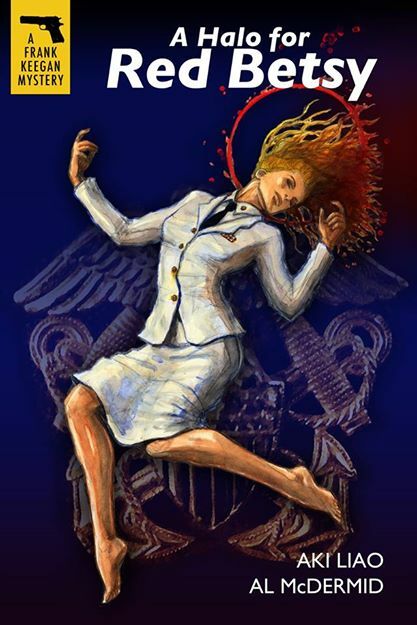 I read both third-person and first-person mysteries, but prefer to write in the first-person, so our narrator, ex-Navy cop Frank Keegan is at the center of A Halo for Red Betsy; he’s telling the story. For better or worse (as one reader noted, it’s not always fun being inside Frank’s head, but it is always interesting because you never know what to expect.). Some books on mystery writing advise having, even starting with, a well-developed, diabolical killer, and that is certainly one way to go (James Moriarty and Hannibal Lecter come to mind), but a vague, shadowy killer that the detective much discover also works well. As noted in “Winging It: Our Ever-evolving Mystery Writing Method #1,” we were so vague about the killer that we were able to change him in midstream with no ill-effect (I suspect our villains will become more flushed out as we perfect our craft). Good examples of both abound, so either works well depending on what the writer is trying to do. The killer in The Cheongsam Bombshell, the second Frank Keegan mystery is both more developed, but still hidden, which he or she needs to be in a first-person narrative (Dashiell Hammett’s Red Harvest being a notable exception). In A Halo for Red Betsy, our victim, Navy Nurse Lieutenant Elizabeth “Betsy” Vale, was killed the night before our narrative begins, and so in one way, was not a character at all (we didn’t use flashbacks, so she had no dialog). Speaking parts notwithstanding, the victim is also central to the story since without his or her death, the detective has nothing to do except gaze at his navel and contemplate the finer things in life. In the case of Lieutenant Vale, as Frank learns of her and her life from those who knew her, he becomes more determined to find her killer. This is another place where our method of winging it really paid off since when we started, we knew very little about her. We knew how and why she became a Navy nurse, and we knew that she had been killed (though we didn’t know why she’d been killed!). We came to know her when Frank did. In Red Betsy, all who knew her told more or less the same story, though Frank did get sidetracked by one unreliable storyline (this is device I want to exploit more fully in future books). As with the villain, some books on mystery writing will tell you to develop your victim before starting, but we enjoyed developing the character as we told ourselves the story. In response to “Winging It: Our Ever-evolving Mystery Writing Method #1,” another writer asked for hints on tying everything together and making sure there are no loose ends. The authors of some books on plotting recommend calculating the number of scenes based on desired word count, then dividing the scenes to fit into a three-act structure, or a five-part structure, or whatever formula the author is employing. It not doubt works for some writers, but if did that, I’d never finish anything. It looks too much like the word problem from hell. Some writers plot out all of the scenes and then write each scene, which are then pieced together—I can’t speak for Aki here, but that’s too organized to work for me. Our method (which is probably driven by my random thought processes) consists more bullet points noting where we want things to go. This “list” then evolves into a standard Roman numeral, Capital Letter, and Number outline format as we go. This outlining is a latter step, coming when we need more details to move the plot forward. Basically, we tend to solve problems as we go. Yes, we had a plan for A Halo for Red Betsy, and we maintained a number of the original elements, but we didn’t used a more structured method because we didn’t want to be tied to any particular element. At least, I don’t. For example, as I noted in the previous post, we had a killer, a motive, and a solution (how the detectives, Keegan and Takeda, figured it out), but as we developed the character of the killer, we realized that our assigned motive didn’t fit with his personality. That left us with one of two options: change the killer’s personality or find a new killer. Changing the motive could have been a third option, but we didn’t consider it. This character was pretty well developed by the time we realized that there was a problem, but we also liked the character as we had created him and so didn’t want to make that change. Plus, his personality as developed tied into another aspect of the story that we wanted to keep, so that wasn’t going to work. Which left us with either introducing a new killer early on (no surprise killer coming out of nowhere for us), or enlisting one of the existing characters. We chose the latter, which then required making changes to that character, including more scenes. Given that we use a method by which we are not tied down, how do we tie everything together? We read it, then read it again, and keep reading it, always considering how things fit. It works something like this: Frank did X on page 36, but now the situation on page 112 is such that Y would have been the better choice. And so, I go back and change X, and subsequent references to X. Then re-read it some more to be sure everything fits. It’s like frosting a cake; it looks messy, you get it smoothed out eventually. A Halo for Red Betsy, available in paperback and on Kindle. BOOM! My approach, exactly. Still, her system is more methodical then how we (my co-author, Aki Liao, and myself) went about creating A Halo for Red Betsy, the writing of which was a haphazard affair. As was the writing of the second in the series, The Cheongsam Bombshell. However, I’ve been reading books about plotting because we’re considering a more complex story for Lost Daughters, the working title of the third Frank Keegan mystery. Plus, we’re hoping that more planning will shorten the overall writing time. How we came to write A Halo for Red Betsy is recorded there, so I’ll skip that story and jump to the process of writing it. The basic structure of a mystery requires a crime (with murder being the most common), a setting, and a detective or detectives. We first conceived this project back in 1998, so I don’t recall which came first in our planning, and I’m not sure it matters since moving forward requires all three. Some books name the perpetrator as the fourth essential element, but we managed to get going without being particularly clear on this point. Naming the killer did come next, however, even though we ended up with different killer by the time we finished it (explaining that would give too much away). We also thought that developing a solution to the crime at the beginning would help the process, but that changed with the killer. Then our beta-readers so hated the new ending, so we had to rewrite it anyway. The last conflict occurred X number of pages ago—time for my detective to run into some trouble. As I said, haphazard, but we’ve made it work. Twice. We took the same free-wheeling approach with our supporting cast and our clues (and red herrings), but I’ll save those discussions for future posts.